Admiral Nimitz assumes command of the Pacific Fleet aboard USS Grayback on 31 December 1941 (U.S. Naval Historical Center Photograph). US Military: Having had time to digest the Japanese attack on Pearl Harbor on 7 December, the United States is in the process of re-calibrating its commands on 31 December 1941. Having placed Admiral Ernest J. 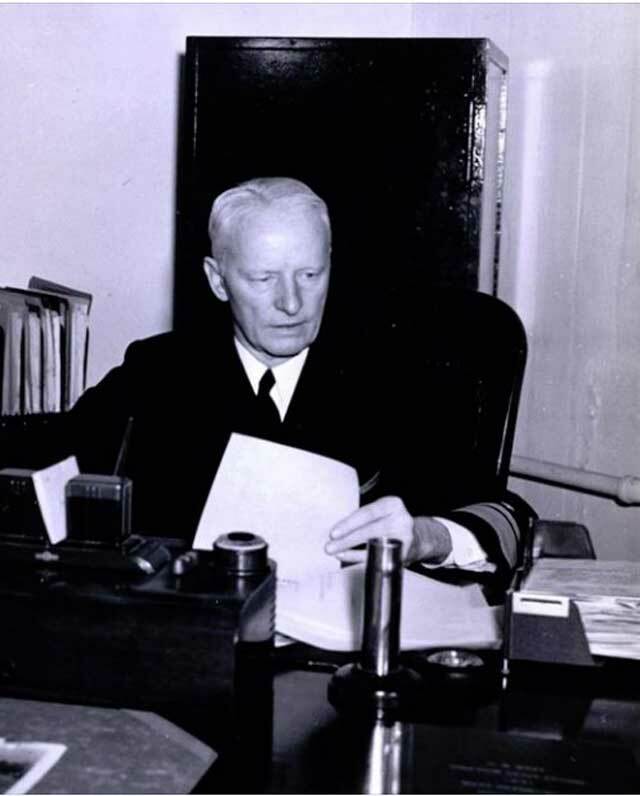 King as commander of the entire US Fleet on 30 December, President Roosevelt and Secretary of the Navy Frank Knox appoint Chester W. Nimitz as commander-in-chief, United States Pacific Fleet (CINCPACFLT). The appointment includes a promotion to full Admiral. Nimitz for many years has been filling a variety of staff positions in Washington, D.C. and thus is not the most obvious choice for the position. Admiral Nimitz back at his desk shortly after assuming command of the US Navy Pacific Fleet, 31 December 1941 (Naval History and Heritage Command Photograph Collection, NH 62027). However, Nimitz has broad-based experience despite his relatively youthful appearance that extends all the way back to the "Great White Fleet" days of Teddy Roosevelt. Nimitz also is a master strategist, at least concerning naval matters, though perhaps just a tad too willing to use the navy's awesome powers for objectives that may not be worth the cost (such as Iwo Jima, we'll get to that eventually). Perhaps more significantly, Nimitz began his career in the Asiatic Station and, at least relatively speaking, is considered an expert on the region. Nimitz replaces acting CINCPACFLT Vice Admiral William S. Pye, who has been tarnished by the highly publicized loss of Wake Island during his brief tenure. Thus, it is generally agreed that Nimitz is the right man at the right place at the right time to prosecute the sea war against Japan. 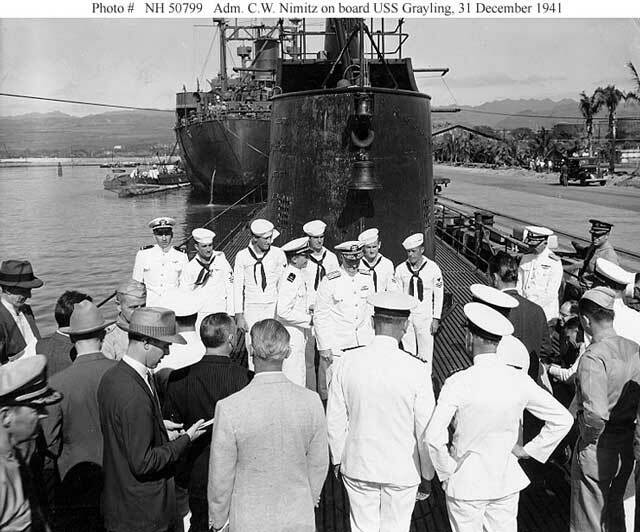 Nimitz already is in Hawaii and takes his command on the deck of submarine USS Grayling because all of the battleships are out of action, with Admiral Kimmel by his side. "Derna, Cyrenaica, Libya. 31 December 1941. A line of Axis bombs reserved for the Allied forces in Libya which will never fulfill their purpose is inspected by a member of Allied aircrew. 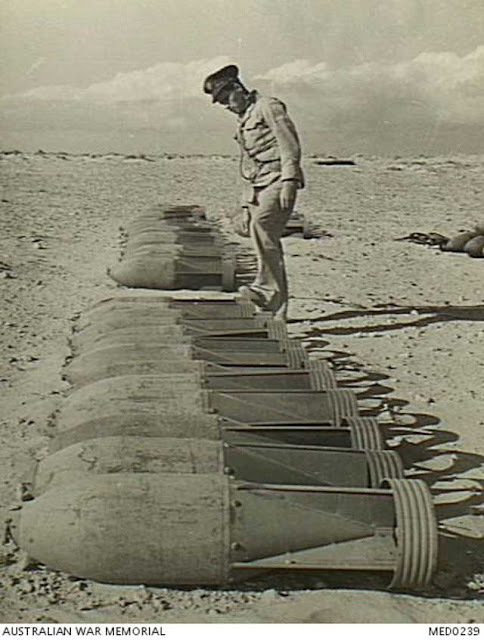 Enormous quantities of ammunition and supplies have been captured by the advancing armies." Australian War Memorial MED0239. In another major appointment, Major General George H. Brett becomes commander of all US Forces in Australia (USFIA). Brett, who recently became embroiled in the Tulsa Incident in Rangoon, has established good relations with both the Chinese and British and, thus, is a politically savvy choice. Brett recently cheated death when his aircraft in Burma was attacked by Japanese fighters and forced to make an emergency landing. Also in the aircraft was British Commander-in-Chief, India, Sir Archibald Wavell, and the incident undoubtedly was a bonding experience. He establishes his headquarters in Brisbane, Australia. General Brett quickly is appointed Deputy Supreme Commander of the American-British-Dutch-Australian Command (ABDA) under Wavell. While he does not become as well-known as Nimitz and MacArthur, Brett could become a very significant figure if the Japanese invade Australia, which is not at all out of the question on 31 December 1941. 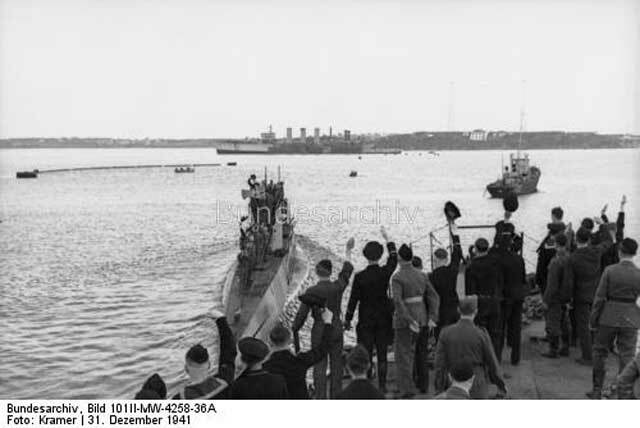 U-74 returns to port at Lorient, France, on 31 December 1941, cheered on by sailors on a passing ship (Chandler, Federal Archive Picture 101II-MW-4258-36A). Overall United States command in the Pacific Theater remains fragmented, with Lieutenant General Douglas MacArthur in control in the Philippines and now Nimitz in Hawaii. It remains unclear who has the overall direction of the United States military response to Japan, or how the response will be conducted. General MacArthur is an army man and has little regard for the navy, while Nimitz is an old-school navy man with little regard for the army. Is the counter-offensive against Japan to be conducted by having the navy seize small islands, or by having the army conduct major campaigns on the larger land masses? Nobody knows. However, the scapegoats such as Admiral Kimmel and General Short have been cleared from the field (MacArthur only escaped that fate by his long political ties in the Far East) and capable replacements made, and that is a start. Battleship Number 40, USS New Mexico, Norfolk Navy Yard, 31 December 1941, just before she deployed to the Pacific. The camouflaged ship alongside the near side of the next pier is USS George F. Elliott (AP-13). Another BB-40 class battleship is on the other side of that pier. 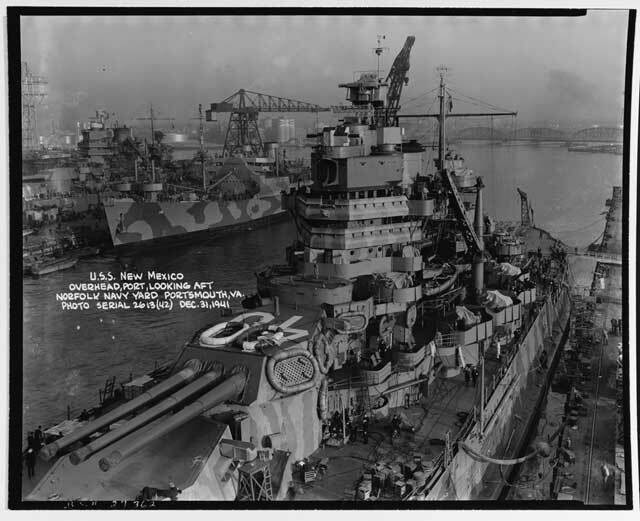 Plainly visible on the New Mexico are Carley floats on the B gun turret. Battle of the Pacific: Even as Admiral Nimitz takes commands, there are nine Japanese submarines just offshore the Hawaiian Islands. They even on occasion have launched scout planes to ascertain damage to Pearl Harbor. Before dawn, I-1 shells Hilo, Hawaii and other Japanese submarines shell Nawiliwili on Kauai and also Kahului. US Army coast artillery guns at Kahului return fire but score no hits. The Japanese cause little damage with these operations, but the intent is to "raise consciousness" of the Japanese power in the area and perhaps stimulate local Japanese and others who are "persuadable" to reflect upon their true allegiance. 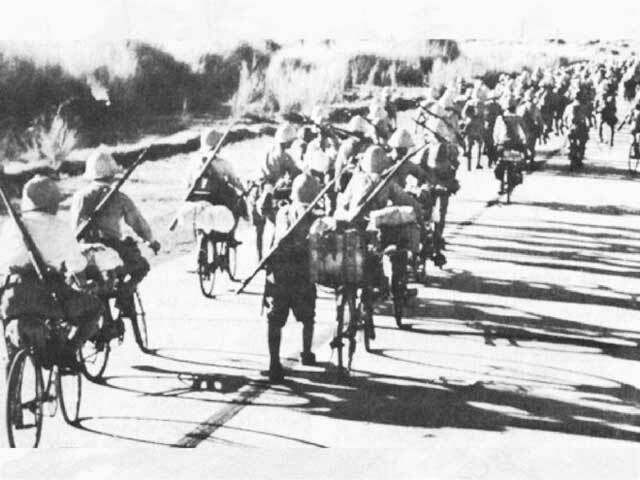 Japanese bicycle-mounted troops on Luzon, December 1941 (US Army Center of Military History). On the Malay Peninsula, the Commonwealth troops have succeeded in forming a defensive line centered around Kampar. The Japanese army has closed up on this line and attacks the 28th Brigade Group in the east near the Kuantan River. The British intent is to hold the line of the Kuantan River and to do this they destroy the ferry. Vivian Bowden, Australia's official representative in Singapore, today describes the Commonwealth air strength now concentrated at Singapore as "pathetic." "Malayan Campaign, December 1941-January 1942. Brewster Buffalo fighters over Malaya coasts. Courtesy of the Library of Congress." National Museum of the U.S. Navy. In the Philippines, the rear echelon of US Army Forces Far East leaves Manila and heads south toward Bataan. Manila now is an open city in a very real sense. The North Luzon Force continues to withdraw toward a short line protecting the entrances to the Bataan Peninsula. The Japanese are racing toward Bataan in order to prevent the Allies from forming a redoubt there. The Japanese reach Baliuag, where the Filipino Army 71st Division briefly delays them before falling back over the Calumpit bridge. US Naval forces continue destroying facilities and vessels as they prepare to depart, including blowing up the aircraft repair shop at Cavite Naval Base and a damaged PBY Catalina there. Other facilities are destroyed at Sangley Point in Manila Bay. The 17th, 20th, and 24th Pursuit Squadrons largely abandon their base at Lubao and head south to Bataan. Stevedoring barge YS-88 loaded with civilian contractors of Contractors, Pacific Naval Air Bases (CPNAB) from Midway, as seen from Tangier (AV-8) arriving at Pearl Harbor, 31 December 1941. The tug is Young Brothers' Mikioi. These men were extremely lucky not to share the same fate as their counterparts on Wake Island who were captured on Wake Island and many of whom did not survive the war. National Archives photo 80-G-26635. The Netherlands East Indies appear to be the next major Japanese target, so the Allies begin beefing up defenses there. The air echelon of the Far East Air Force's 30th Bombardment Squadron transfers from Batchelor Field near Darwin, Australia, to Singoasari, Java. These B-17 Flying Fortresses will provide support for the Dutch naval forces in the region. In Borneo, Lieutenant Colonel Genzo Watanabe of the 2nd Yokosuka Naval Landing Force takes his troops northward to occupy Brunei, Labuan Island, and Jesselton (now called Kota Kinabalu). Allied troops are now on the run throughout Borneo and have fallen back into the jungles of the interior. "Western Desert, North Africa. c. 31 December 1941. 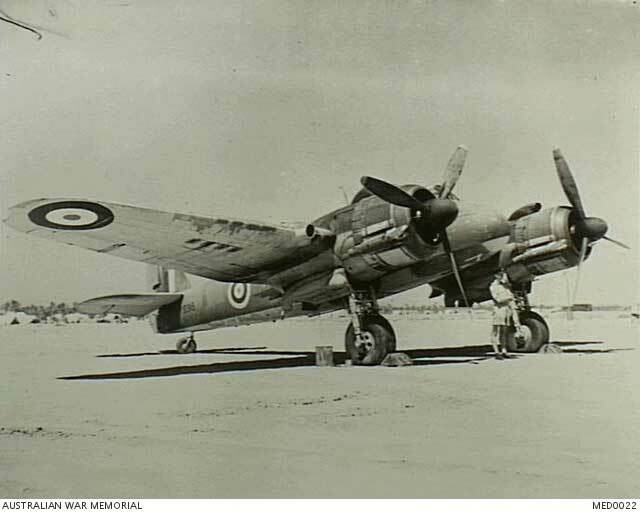 One of the deadly Bristol Beaufighter aircraft, serial no. T3316, operating on the battlefront. Since the British Army offensive commenced three days ago, these heavily armed fighters have destroyed nearly thirty enemy aircraft." Australian War Memorial MED0022. 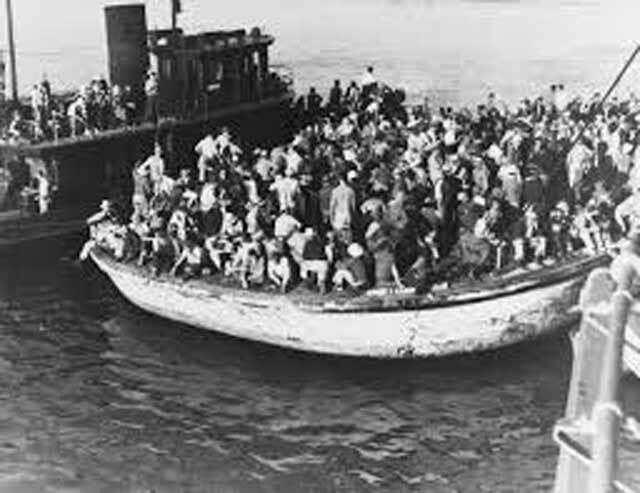 Battle of the Mediterranean: There is still a large force of Germans trapped at Bardia. Panzer Group Africa commander Lieutenant General Erwin Rommel attempted to relieve Bardia during the Operation Crusader battles but failed. Today, South African 2nd Division and 1st Army Tank Brigade of British 30 Corps of Eighth Army attacks Bardia. They are assisted by bombardments from Royal Navy light cruiser HMS Ajax (22), the Australian destroyers HMAS Napier (G 97), Nestor (G 02), and Nizam (G38), and the British destroyers HMS Arrow (H 42), Gurkha (G 63), and Kingston (F64). The Commonwealth troops make good progress on the main road from Tobruk. Rommel's tanks have withdrawn far to the west, so the trapped Germans have very little hope of being rescued. However, morale is high in the Afrika Korps, so they continue to hold out, perhaps using the Allies' successful hold of Tobruk as a model. 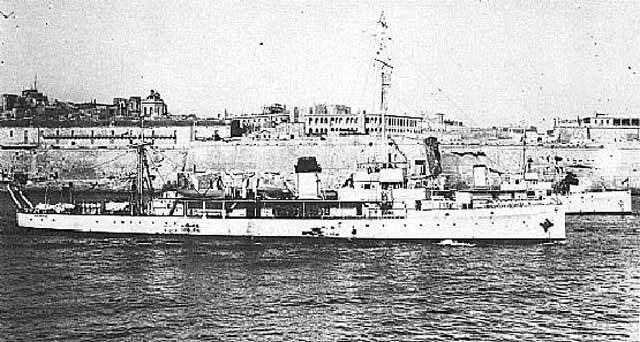 Royal Navy minesweeper HMS Abingdon, shown, is sweeping mines just off of Malta during the day when it is attacked by two successive waves of Luftwaffe Bf-109 fighters. The ship shoots one of the fighters down. Seven sailors are wounded, three seriously. From now on, Abingdon will only be allowed to operate at night. The Fuehrer has categorically forbidden any retrograde movements to the Koenigsburg Position. Only local evasive movements under direct enemy pressure will be allowed. All reserves are to be sent to the front, and [the troops] are ordered to hold every locality and support point. Thus, the die is cast: either the German troops will defend where they stand, or they will not, but they won't be welcomed at any point further west. 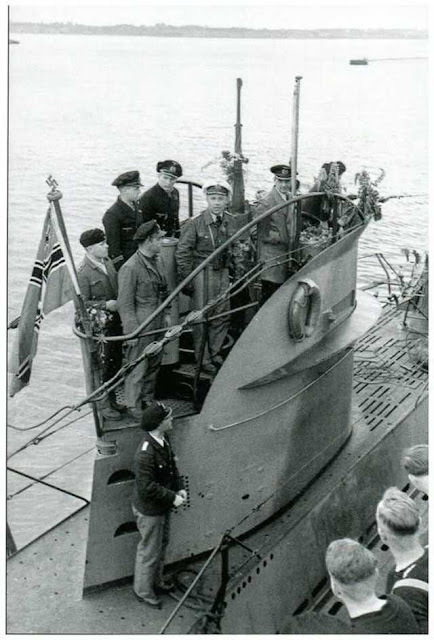 U-74 (Kapitänleutnant Eitel-Friedrich Kentrat) returns to port at Lorient, France on 31 December 1941 (Kramer, Federal Archive Bild 101II-MW-4258-33A). In the Crimea, German 46th Infantry Division has halted its breakneck retreat from the Kerch Peninsula and reoriented itself back toward the Red Army units advancing toward them from Feodosiya. During the afternoon, Lieutenant General Kurt Himer's troops attack northeast of Vladislavovka. They make no impact, in large part because they lost 80% of their vehicles during their retreat. Himer heads west to set up a new headquarters and loses touch with his division, leaving his troops on their own. The fighting continues sporadically but inconclusively. After dark, the division's regimental commanders decide, in the absence of any orders, to retreat again and set up a new front west of Vladislavovka facing east. This ends the German attempts to eradicate the Soviet bridgeheads and begins a long stalemate on the Crimea, with the Germans in firm possession of the western half and the Red Army in complete control of the Kerch Peninsula. Himer and Lieutenant General Hans Graf von Sponeck, commander of 42nd Army Corps, are recalled to Germany to explain their actions. 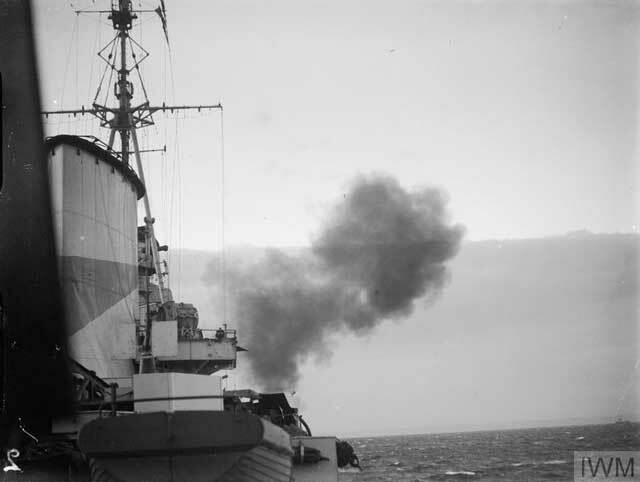 "On board HMS AJAX, looking forward, as rounds from her six-inch guns are fired into Bardia. Libya" 31 December 1941 (© IWM (A 8038)). They are fighting with the greatest vigor and on quite a large scale, and we don't hear very much of what is going on there. It is all very terrible. Guerilla warfare and the most frightful atrocities by the Germans and Italians, and every kind of torture, but the people keep the flag flying. The partisan movement in Yugoslavia, of course, is exactly what Churchill says it is. However, it is a lot more complex than that. Royalist forces and communist forces have an uneasy alliance that could fracture at any moment. However, there is no question that the partisans are causing the Italian and German occupiers endless troubles. 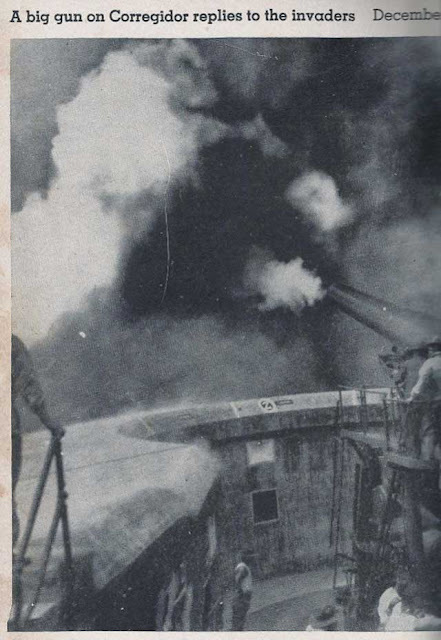 "A big gun on Corregidor replies to the invaders." ca. 31 December 1941. US/British Relations: Churchill returns to Washington after a brief trip to Ottawa and the Arcadia Conference continues. The conference participants create a joint American-British-Dutch-Australian (ABDA) Command to control Allied operations in the southwest Pacific. British General Wavell will command ABDA, seconded by US General Brett. ABDA's main force at the moment is a powerful Dutch naval squadron commanded by Admiral Karel Doorman in the Netherlands East Indies. American Homefront: The U.S. government has banned the use of chrome in private automobile production, so today is its last use by the major car manufacturers for quite some time. Tire purchases already have been restricted. Overall, private automobile production virtually disappears in the coming weeks and months as plants are converted to war production. Car production is replaced by vast quantities of military vehicles such as jeeps and staff cars, some of which can be used eventually by private citizens and also lead to civilian models. 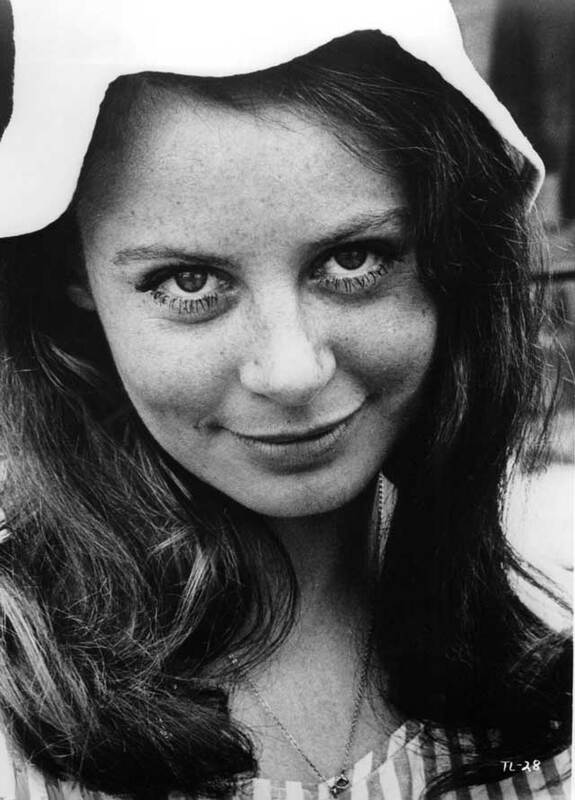 English actress Sarah Miles is born on 31 December 1941. Miles gets her first role on television in 1961. Her last film role is credited in 2016 and Miles is retired from the film industry as of 2019.